The United Nations created 17 Sustainable Development Goals, or Global Goals, in September 2015 for corporations and countries to guide them toward inclusive and sustainable societies. The goals range from zero poverty and hunger to quality education and health globally by 2030. Undeniably, these global goals appeared optimistic and, for some, bordered on the impossible. 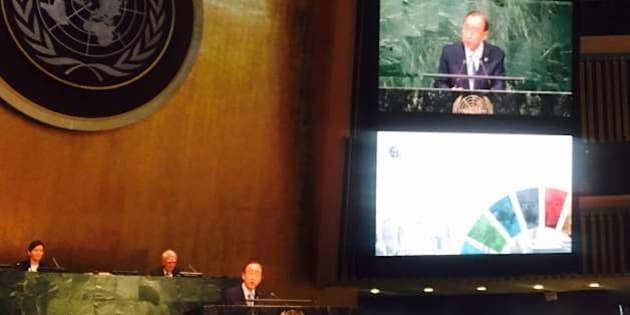 This June, the UN Global Compact, a business network of 8,800 companies and 80 countries, launched a Leaders Summit for advocates and corporations to discuss the achievement of these goals, and the incorporation of human, labour, environmental and anti-corruption rights in their business practices. As I sat under a large golden emblem of concentric circles and olive branches, I prepared myself for first day of the summit. I awaited speeches from global leaders, including the UN Secretary-General Ban Ki-Moon, Global Goals advocate Dr. Alaa Murabit, Ambassador Macharia Kamau and the Argentine Minister of Foreign Affairs. The range of topics, the idea of eradicating poverty and ensuring equality; I was overcome by the ambition of the project, and the 15-year cap on its achievement. In the wide halls of the United Nations headquarters in New York, as delegates and leaders began to fill empty chairs, I suddenly felt very small. Lise Kingo, Executive Director of the Global Compact, commemorated the summit by introducing 2016's Sustainable Development Goal Pioneers: 16 new entrepreneurs distinguished by redefining themselves in the new era of technological business, and relating their operations to the achievement of the goals. While the summit focused on the financing of the Global Goals, leaders stressed the importance of altering mindsets, viewing the goals in their entirety, to evade being overwhelmed, as I was gradually becoming.They emphasized the change in markets, the pertinence of corporate introspection, and the realization that businesses -- and governments -- cannot operate as they once did, "there is no plan B, because there is no Planet B" they reiterated. Is it sustainable for emerging entrepreneurs to think 'sustainably'? The second day of the summit provided practical examples from companies and CEOs around the world. Peter Lacey, Managing Director of Accenture Strategy, asserted that 87 per cent of companies' CEOs are already there, innovating in responsible fields, believing that the Global Goals are an opportunity to refresh, rather than mere tasks to be completed. Chang-Gyu Hwang, CEO of KT a Korean Telecom giant, provided examples of its use of GPS data technology to source the spread of infectious diseases in Korea. Suez, a French industrial company, shared its experience of partnering with the government to aid the development of accessible water supplies for emerging countries.Tech and industrial giants dominated examples of segueing into to the tech-welfare market, and developed countries presented entrepreneurs striving for both profits. And the summit indirectly highlighted this gap between our current world and the sustainable one envisioned by Global Compact Leaders -- for some countries more so than others. It necessitated the role of the private sector. It underlined the collaboration with the public sector, and weighted the involvement of women and youth. As the MD of Standard Chartered Nigeria, Bola Adesola, took the stage, my mind drifted to small-to-medium sized companies for whom financing the Global Goals may not be so easy. My mind also floated to further continents, where "innovate" is superseded by "survive." Is it sustainable for emerging entrepreneurs to think 'sustainably'? Will larger corporations provide that financial hand to smaller corporations, striving to innovate for welfare? Regardless of innovation, I thought, without using business networks in a manner that allows actual dependency, achieving the Global Goals is idealistic in the least. [I]f you think you are too small, you have not yet spent the night with a mosquito. Naturally, this doesn't entirely displace my concerns and criticisms for the achievement of the Global Goals, but it did inspire me to use my youth to go out and potentially redefine markets, redefine cooperation. The Global Goals, ambitious though they may be, stir the thought of accomplishing them, and force us to envision the world future generations will grow up in. I am aware that we have not succeeded in these 17 arenas, in fact, we are far from it -- but what if we do?